Maya Coin – The Best in Cryptocurrency Ever!! to the next level and Beyond. We are proud to introduce Maya Coin, a great business plan that will change the world of acquisitions. Know our superiority. Experience our competitive advantage. Integrates blockchain technology to provide unique identities for each business. Maya Coin has a great business plan with high growth potential.  An efficient global system covering all corners provides the highest data security. Maya Coin will be released on the basis of Ethereum platform. The compatibility of the token with third-party services wallets, exchanges etc. provides easy-to-use integration. Once you’ve entered into our ecosystem, you can manage everything. Anyone with a smartphone and an internet connection can participate in the global marketplace. Our user-friendly app will be easy to understand and gives you up-to-the-minute updates on your transactions. Here is a short list of other benefits this app will provide to you. The MAYA Team combines a passion for providing Coinholder value, industry expertise & proven record in finance, development, marketing & licensing. Rodrigo is an entrepreneur and investor with more than 12 years of successful experience on creating and managing companies in different countries. A bold approach to solve worlds challenges has helped him and their investors to constantly make profits in sustainable businesses over the years. He currently owns a private hedge fund and is fully committed to take Maya Preferred 223 to the entire world. Zuher Shefan is a graduate from higher institution of computer technology of Tripoli. Mr. Shefan was the chief editor of the Libyan Medical Journal, whose articles have been read all around the world. Mr. Shefan is a master in full website developing and has completed projects for many high profile companies. Mr. Shefan is a Web app creator such as online booking, web applications and E-commerce. He has also ran numerous digital marketing campaigns ( SEO , Email marketing, video marketing , social media marketing, Google ad word and Bing marketing ). Mr. Shefan has worked on hundreds of cryptocurrency related projects such as cryptocurrency ICO setups, the creation of cryptocurrency ERC 20 and ERC 23 token smart contracts, The creation of cryptocurrency exchanges and trading sites and logo design for crypto currencies. Mr. Shefan will use his expertise in business, especially in cryptocurrency to lift Maya Preferred to the next level and helping Maya Preferred to be accepted in retail stores worldwide at a much more rapid rate. Mr. Christiansen is fully licensed to provide a variety of professional investigative services, process services, and surveillance for most legal reasons. Mr. Christiansen will use his 40 years of experience in multiple levels of security training to ensure all Blockchain transactions and ERC20 tokens MAYA creates are fully protected with the most up to date anti-hacking programs. Mr. Christiansen will play a huge role in protecting MAYA’s upcoming project of creating MAYA’s own cryptocurrency exchange from any unwanted trojan horses or cyber criminals. Fully insured and bonded, Mr. Christiansen does all that he can do to protect the interest of his clients and now all Maya Coin holders also. >Maya Coin will reveal the first industry coin to the crypto world. >The start of building MAYA’s own full functional cryptocurrency Exchange. This is where Maya Coin itself and all coins MAYA creates will trade on, along with all popular tokens like BTC, LTC & ETH. This project ensures all coin holders an exit strategy to their Investments. >Any additional cryptocurrency exchanges where Maya Coin will be traded on. 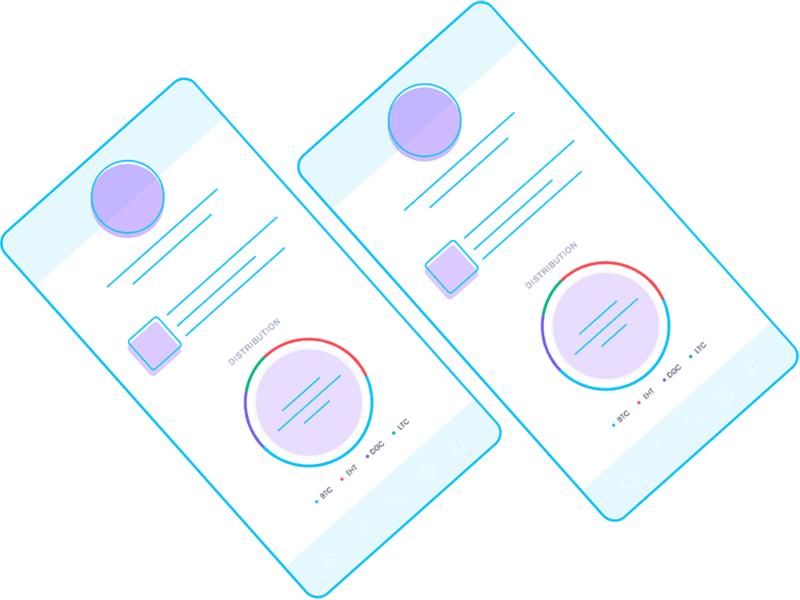 >The percentage of free tokens all Maya Coin holders will receive of any new tokens MAYA creates. >Newly formed divisions under the Maya Coin umbrella. >The additions to the management team and Board Of Directors of MAYA.Maya Coin’s business plan being executed. >The names and business plans of all new tokens MAYA creates. The following Q and A will provide information about Maya Coin and its benefits. If you have any other questions, please get in touch using the contact form below. How do I benefit from the Maya Coin Crowdsale? Buying our token means you are partnering with us for our bright future. We will continually be working on new ideas and new technologies to better our partnership with you. There is no limit to where we can take Maya Coin with the work we are willing to put in. Being involved in the early stages of this platform puts you in the best position for when we are fully operational. Follow us on any of the links provided on this page to see what is happening. We will provide weekly updates on all available forms of social media. You can also use Maya Mobile App to track progress. How will Coinholders receive free tokens of other coins that MAYA creates? Maya Coinholders will receive a proportionate number of free tokens of every token created at no additional cost for future acquisitions. Even owning one coin means that a Maya Coinholder can add dozens of tokens to his / her portfolio for free. What is an industry coin? 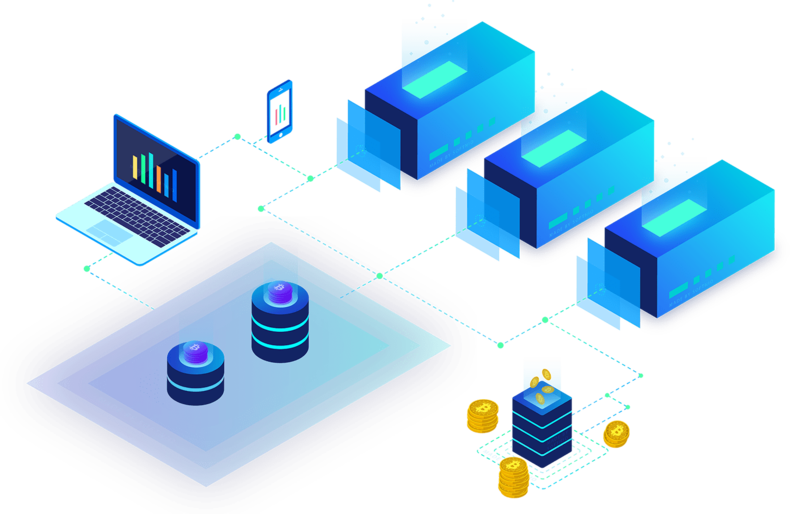 Maya Coin will introduce industry coins to the cryptocurrency world which is where the top minds in a field of business are joined together into their own coin. Maya Coinholders will receive a portion of the new coin just created. You can join the Crowdsale by creating a new account on our website and crediting your account with one of our accepted cryptocurrencies. Once you have your Maya account funded, you may use that to purchase as many tokens as you wish once the Crowdsale begins. What cryptocurrencies can we use to purchase MAYA? When do the token sales begin? Pre-Sale sales will commence on June 20th, and our Crowdsale sales will begin July 20th, 2018. When will we reach the soft cap? Our soft cap will be set at $1 million total. This number will include all token sales from the Pre-Sale beginning in June 2018, all the way through the end of our crowdsale on July 23. Sales are not allowed to residents of the United States, or any state where there are regulations in place to prevent participation. What will happen to excess tokens after hard cap is reached? After the hard cap of token sales is reached, we will burn off the excess tokens. There will be no tokens produced after the initial sales we are running. Metamask is a secure web wallet which can be used to store tokens. You can also add metamask to chrome browser as an extension. Please use the guide below to add your newly purchase SPTI tokens to the Metamask. Please go to the metamask, click “Tokens” and then on “Add Token”. Put “0x14468FF6b324f1C5A869e62B9C442846e7D0baf1” in Token Contract Address field. 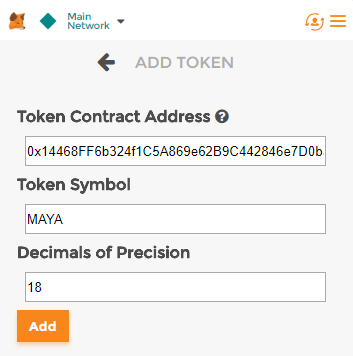 Put “MAYA” in Token Symbol field. Click Add, and you’re done.